The /Ai-/Ais Richtersveld Transfrontier Park was publicly declared in 1968 and spans an area of about 6 045 square kilometers. The Orange River forms the northern boundary of the Richtersveld in South Africa and the southern border of the Fish River Canyon conservation area in Namibia. A treaty was signed on August 1st 2003 by the then presidents of South Africa and Namibia due to the similarity of the flora and fauna; landscapes and geology in the area. 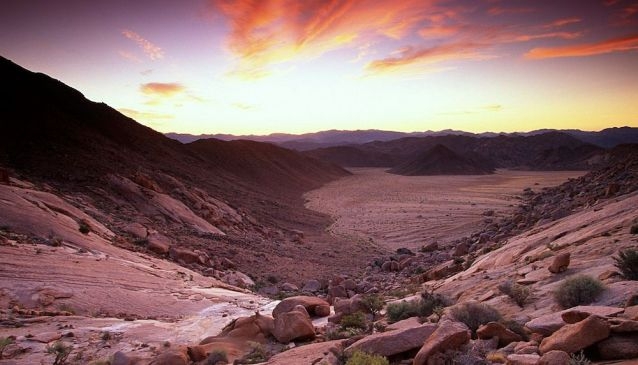 S.A’s Richtersveld National Park and the /Ai-/Ais and Fish River Canyon Park were amalgamated to form the /Ai-Ais Richtersveld Transfrontier Park, which is Namibia’s first cross-border park. 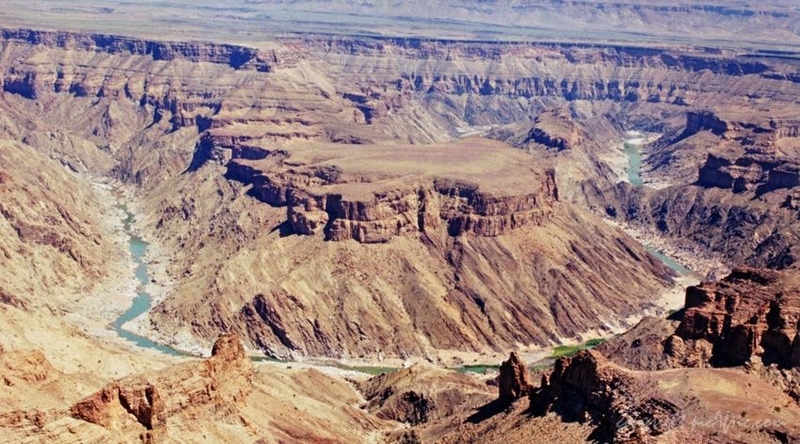 Visitors in the area can enjoy the wonders of the Fish River Canyon, which is the largest canyon in Africa and the second largest canyon in the world after the Grand Canyon in America. There are amazing photographic opportunities at the canyon which is littered with large boulders. It is in this area where one of the more thrilling walking trails can be experienced, the Fish River Canyon hiking trail which lasts five days and encompasses 90km. There are breathtaking views across the canyon from Hell’s Corner and Sulpher Springs as visitors drive along the rugged eastern rim of the canyon. The park contains some pretty rare plants, over 1600 plants species and about 100 of these are endemic succulents. There are also rare animals to be found and thermal springs as well. The park is managed by South African parks and its Namibian counterparts. Visitors can cross at the border post at Sendelingsdrift by ferry across the Orange River. The ferry transports vehicles weighing six tonnes or less. Facilities at the park include 12 campsites; a field kitchen and ablution facilities which ae available at Hobas. Other accomodation options include Ai-Ais Hot Springs Resort; Canon Lodge and Canyon Roadhouse. The Ai-Ais hot springs spa & resort is located at the southern end of the Fish River Canyon and offers thermal baths and heated swimming pool and adventure filled hiking trails. The resort is set at a sulphurous hot spring which makes its name /ai-/ais very appropriate because it means ‘burning water’ in the local Nama dialect. Improvements at the resort include a new restaurant and bar which serves buffet meals for breakfast; lunch and dinner and can seat up to 100 guests. Other facilities include a laundry room; room service; secure parking and ramps for the disabled into all the buildings and rooms. Accommodation consist of either rooms or premier chalets. There are 12 double rooms with river views and 24 with mountain views and are all situated in the Spa complex. The river view rooms have en-suite bathrooms with a bath; air-conditioning; tea/coffee station and an outdoor shower, the mountain view rooms have en-suite bathrooms with a shower; air-conditioning and a tea/coffee station. There are seven permier chalets which are perfect for families or groups and are equipped with en-suite bathrooms and air-conditioning. The three bedrooms either have a three quarter size; two queens or one king size bed in each room. The self-catering kitchen is equipped with a refrigerater; two plate stove; microwave oven; kettle; pots/pans and plates/cutlery. The main feature at the resort is the cooler outdoor pool and obviously the indoor thermal pool. Canon Lodge is located on the privately owned Gondwana Canyon Park. It is about 20km from the main viewpoint of the Fish River Canyon and is built from natural materials including local rock and thatch roofs. The lodge’s main area lies in the shelter of a granite hilltop and houses the reception area; an indoor restaurant and the bar. There is also a safe where guests can keep their valuables. Breakfast at the lodge usually includes yoghurt; cheese; cold meats and eggs which are supplied by their very own butchery; dairy and smokehouse. A light lunch can be ordered from the a la carte menu and for dinner, guests can expect hearty game dishes and delicious side dishes from the buffet. Accommodation is in 25 thatched; natural stone and wood bungalows. All the units are equipped with comfortable beds; en-suite bathrooms; air-conditioning and mosquito nets. The Canon Roadhouse is located about 25km from the Fish River Canyon on the privately owned Gondwana Canyon Park. There is a large swimming pool where guests can cool off and a sundeck which is the perfect place to relax. Guests can also enjoy a drink or two in the ‘Wheels’ bar. The lodge offers laundry service and internet connection. Canyon Roadhouse is reputed for serving delicious meals and personalised service. Breakfast; lunch and dinner are all served in the lodge’s restaurant. Breakfast is served buffet style with options of cereal; fruit or a full english breakfast complemented with fruit juices; coffee and tea. Lunch and dinner are served from an a la carte menu. Fresh salads and sandwiches can be ordered for lunch and the dinner menu has a varied choice of international-style dishes. Accommodation is in 24 double or family rooms. The double rooms have en-suite bathrooms; twin beds; air-conditioning and mosquito nets. The family rooms can accommodate up to four people and has similar features as the double rooms.